In November we made a Lightening McQueen cake for Bob the Builder’s birthday, and at the time Top Gun repeated over and over how he wanted a Mater cake for his birthday. Well, two months ago he changed his tune after becoming obsessed with airplanes. 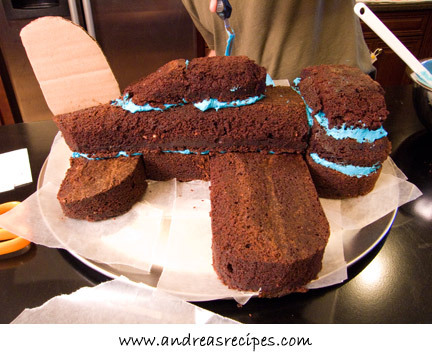 “Mommy, Daddy, I want a crashed airplane cake. Mommy, you make the cake, and Daddy, you decorate it.” A crashed airplane? Huh? 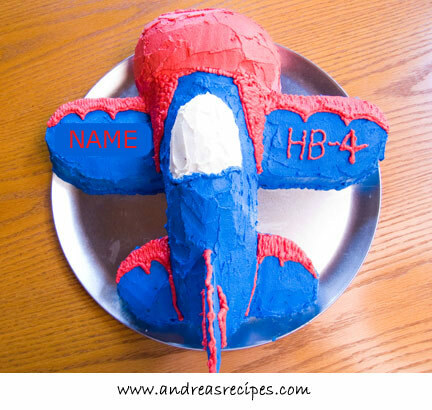 We pictured an airplane upside down in a pile of dirt and smashed parts or tail end up in a body of water, and that’s just a little too dark for a four-year-old’s birthday cake. So even though Michael had been planning that Mater cake for three months (sometimes planning ahead can backfire), we switched gears and started thinking airplanes, not that Michael really minded since he’s an aerospace engineer and has an obsession with aircraft going back to his own childhood and seeing the Apollo 11 moon landing on television in 1969. Yes, the love of all things that fly is deeply rooted. 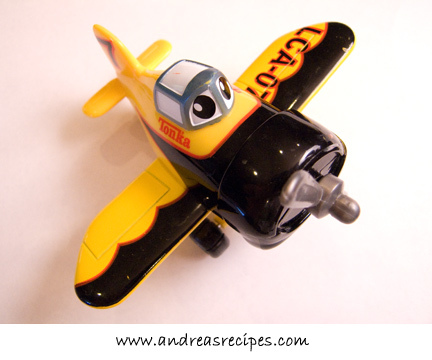 Top Gun chose one of his airplanes to be the model, a Tonka Lil’ Chuck airplane, which is based on a GeeBee Model Z. Michael took that model and designed the shape of the cake but made the vertical tail, or the rudder, larger so it would have room for the birthday boy’s age. 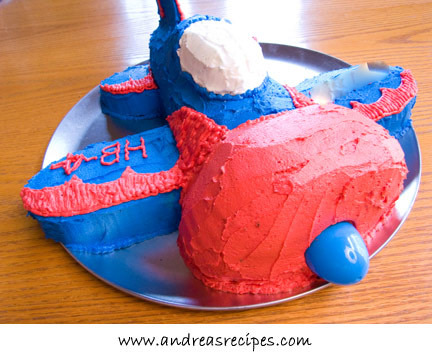 We chose red and blue frosting instead of the GeeBee’s traditional black and yellow colors because the black frosting can get really nasty, especially when there’s a lot of it. It turns your lips, tongue, and teeth black, which can be fun for Halloween but any other time is just a big mess. Michael thought the red and blue would look very patriotic and the blue is similar in color to an F4U Corsair, which is Top Gun’s favorite airplane. We decided on chocolate cake, and I made three batches of batter and baked two batches in an 11×15 pan and one batch in a 9×13 pan, though you can do all the batches in 9×13 pans. We let those cool overnight before carving the next day. I also made three batches of frosting, though it turns out we could have gotten away with 2-1/2 batches as we had plenty left over. Michael drew patterns for this cake and laid the pattern pieces on the cake while cutting. There were extra pieces of cake left over, but they didn’t last long because Top Gun was sneaking into the kitchen and nabbing chunks, leaving a trail of crumbs around the house. 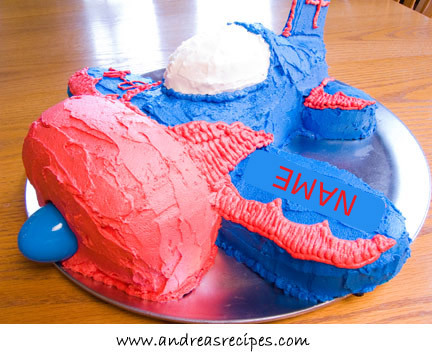 The cake has two layers for the body of the plane (fuselage) and the cowling (propeller area) plus a small third layer for the cockpit and the top of the cowling. The wings and the elevators (rear wings) are made from one layer of cake, and the rudder is a piece of cardboard. Michael tried to make it from a graham cracker, but it didn’t work well with the curve and kept breaking even when using an X-Acto knife. We belatedly thought of leaving the graham crackers out to get stale, which might make them easier to cut. We made a pattern for propellers, which would have also been cardboard due to the curves, but in a time crunch we decided to go representational rather than mechanical, so we just joked the propellers were moving too fast for the naked eye. If you want to try the propellers, you can mount them with a toothpick in a marshmallow covered in frosting. 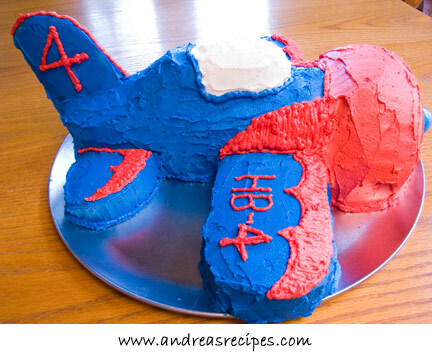 Carving with a serrated knife gives the airplane its curves, so having a cake of the right consistency is important. A cake with a very soft crumb will not carve well, and I recommend avoiding box cakes for that reason. The yellow butter cake and chocolate cake we have used in the past work well for carving. They are quite moist and flavorful, but have a firmer crumb that doesn’t collapse when trying to carve. Makes a big cake, about 30 servings. I use Wilton Decorator Preferred and Performance Pans for our cakes because they are widely available at craft stores, and that’s particularly helpful since we don’t have any restaurant supply stores nearby. Sometimes the pan instructions do not match the recipe instructions for such things as oven temperature and baking times, so I usually follow the pan instructions which seems to produce a more level and evenly baked cake. 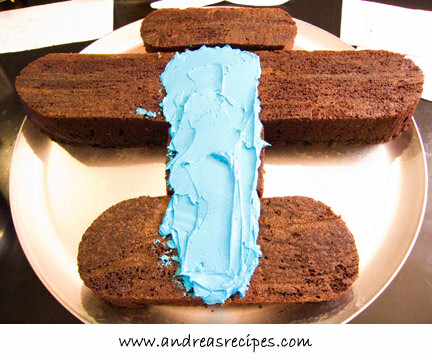 The pans require greasing and parchment paper to ensure a good release when removing the cakes. Dark nonstick pans require lowering the oven temperature 25º F and will sometimes bake the edges long before the middle is done, resulting in dry cracked edges. I like them for smaller round or square cakes that bake evenly, such as 8 inches and 9 inches, but over the years I’ve stopped using them for larger round or rectangular cakes. 3. BUTTERCREAM: Mix 3 batches of either pure buttercream or the buttercream with shortening (helpful if the weather is really hot and humid). Color as desired and store in the refrigerator. You will need about 1 cup of white frosting for the cockpit window, 2 to 3 cups of red, and 3 to 4 cups of blue. 2. Arrange bottom cowling, wings, bottom of fuselage, and rear elevators on a large pan according to the photo below. 3. Add a layer of blue frosting where the fuselage will go. 4. 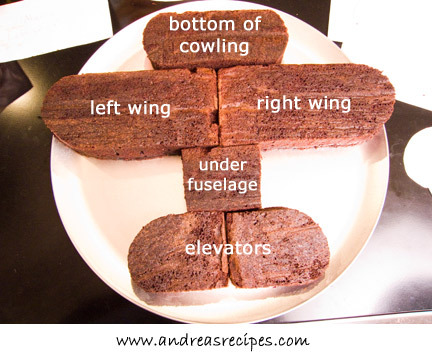 Place the fuselage on top of the cake with the rear point sticking off slightly. 5. 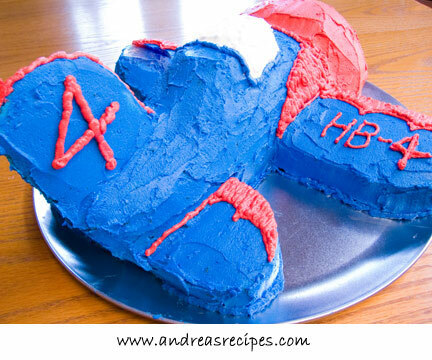 Add a layer of blue or red frosting on top of the bottom cowling and add the next bottom cowling. 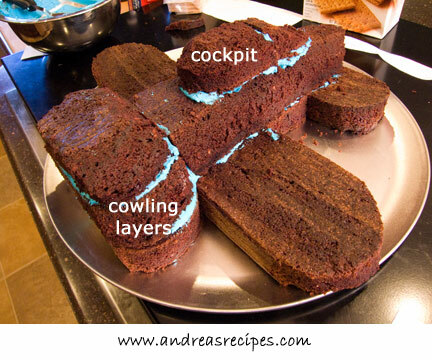 Add another layer of blue frosting to the cowling and place the third layer on top. Add a frosting on top of the fuselage just in the area where the cockpit pieces will go. Put the cockpit pieces in place. 6. Use a serrated knife to shape the cowling and cockpit, making them slightly rounded per the photo above. 7. Cut a vertical slit in the fuselage above the elevators, but don’t go all the way through to the pan, then place the vertical tail in the slit. 8. 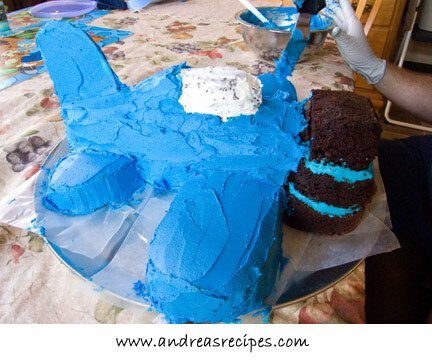 Cover the wings, fuselage, elevators, vertical tail, and part of the cockpit with a crumb layer of the blue frosting. 9. Cover the window part of the cockpit with a crumb layer of white frosting. 10. 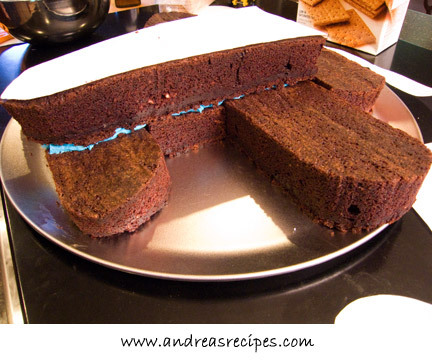 Cover the cowling with a crumb layer of red frosting. 12. Pipe decorations on the wings, elevators, vertical tail, and anywhere else you like. 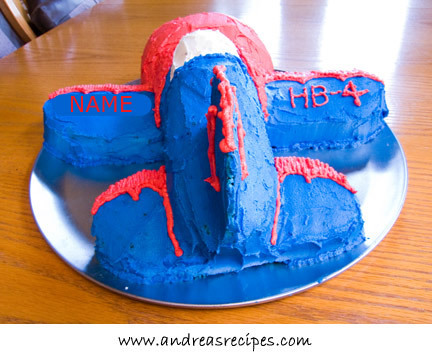 We put the name on the left wing, the age on the vertical tail, and HB-4 on the right wing, which looks like the airplane number and stands for “Happy Birthday-4. Great post. If I had kids I would go crazy with cakes. woah, totally awesome!! I love how you and Michael always get such great 3-D shapes. BTW, for restaurant supply stuff, I’ve had great luck ordering from http://www.surfasonline.com/ True, you have to pay for shipping so not as inexpensive as a true restaurant supply store (and for most stores, you have to be able to provide a business license to shop there anyway), but Surfas is still cheaper than a place like BB&B. I’m going to put a link on my blog – my readers are definitely going to want to see this! Love how you included step by step photos. It turned out just wonderful!!! Great cake! My son loves cakes and I love baking but I still haven’t had the time or guts to try something that intricate. Wow. That cake is awesome. Thanks for the comment BTW. I plan on making my daughter’s birthday cake also. I wish I was courageous enough to make a cake in the shape of one her favorite character. Wonderful cake! My son would love a cake like that! this is such a beautiful piece of work, great combination of color too, salute! That is awsome. I am going to try that for my kids birthday. Thanks! Thanks for bringing back memories of my own kids’ birthdays. I remember spending hours making a horse’s head for my daughter’s ninth — milk chocolate frosting, dark chocolate mane. Thank God we hadn’t seen The Godfather before then. WOW! Great job! So cute, and looks like it tastes good also. Thank You! I made this cake for my son’s 5th birthday and he loved it! The directions were so clear and made it easy to assemble. Thank you for sharing this. Hi! 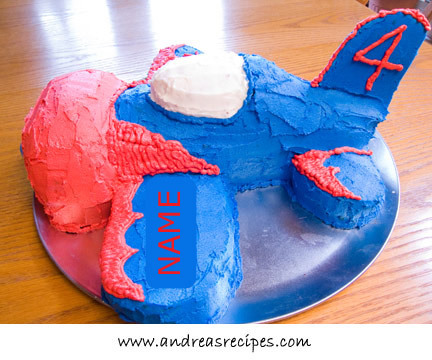 I just had to let you know that I made an airplane cake last night from the templates you posted and it came out awesome! Your directions were great and the design is really cute. 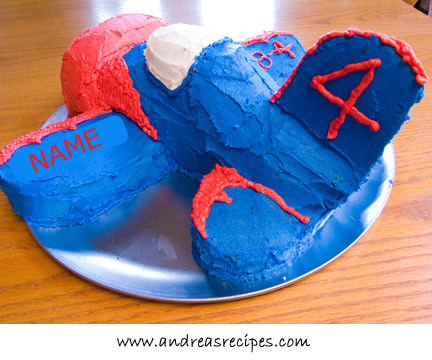 My husband flys radio control airplanes and I decorated the cake to look like a plane we got him for his birthday (yah, the cake is for him). It came out sooooo cute! I was able to make the vertical tail from a piece of Arnolds flat bread. I cut it to size and then toasted it. Same thing with the prop! I love that you used the Easter egg, such an innovative idea! We only have about 20 people coming for cake tonight so I cut the templates out to be a little smaller than you designed them and I was able to cut all the pieces out of two 9×13 cakes. (I did two Dunkin Heines batters but made my own butter cream). Well I just had to say thank you for your post. It was really helpful! My husband loves the cake, and that makes me happy! Made this cake tonight for my nephews 2nd birthday. His mother and i made it very easily because of your templates and instructions. Thank you for this awesome cake! !